It seems that the modern bus scene in London can change by the hour! New vehicles are being introduced and operators sometimes change the routes they serve due to the tendering process. All of this is highly regulated, but considering the size of the London area it seems that these changes are taking place every day! The independent transport videos cameras have been out and about in the capital recording some of these changes for you to enjoy. 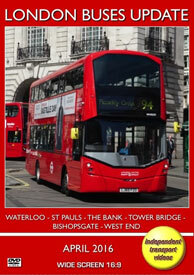 This is the first of an occasional series of DVD programmes recording the contemporary bus scene in London. This first edition was filmed on two occasions in April 2016, and to add some nostalgia we also visited the Spring Gathering event at the London Bus Museum, Brooklands in Surrey on the 17th April. There are some twenty different locations, many in the City of London, visited in this programme. These include, Waterloo Road, Waterloo Bridge, Strand, Aldwych, St Paul’s, Cannon Street, The Bank, King William Street, London Bridge, Tooley Street, Tower Bridge Road, Bishopsgate, Moorgate and London Bridge Station. We take a ride on HA16 (LK65 BYS), a new ADL Enviro400H City on service 78 towards Shoreditch. This bus is operated by Arriva. A further ride is on board MEC50 (BT09 GPJ), a Mercedes-Benz Citaro 0530 on service 521. This bus is carrying the original ‘Red Arrow’ livery to commemorate the introduction of the first Red Arrow route back in 1966. For this occasion it has been renumbered MBA50 in recognition of the AEC single deckers used on the routes. Further filming locations are Piccadilly Circus, Regent Street, Oxford Circus, Oxford Street and Marble Arch, with a brief visit to Victoria to record green liveried New Routemaster LT2 (LTZ 1002) arriving on service 38. As you will see on this programme there are many types of buses running in London, too many to list here - gone are the days of standard RTs and RMs! However, some of the highlights of this programme to look out for are, EI1 (YP15 NLM) one of two Irizar i2e Electric 12.0m single deckers seen on the 521, and the VDL SB200 Wrightbus Pulsar 2 Hydrogen Fuel Cell single deckers on the RV1 service. The all-new ADL Enviro400H City double deckers operated by Arriva on the 78 service and the ADL Enviro400 MMCs operated by Stagecoach, are also featured. We also capture MHV2 (BU16 OYM) a Go-Ahead operated Volvo B5TL with Egyptian built MCV EvoSeti body on driver familiarisation in Bishopsgate. Also look out for the new Volvo B5TLs with Wrightbus Gemini 3 bodies sporting the ‘Streetdeck’ front, operated by RATP owned London United on the 94 service. To conclude our programme we make a brief visit to the London Bus Museum at Brooklands to see some of the visitors to their Spring Gathering. Apart from the superb line-ups of both red and green RTs we also see RLH61 (MXX 261) now returned from Canada, displays of early Routemasters as well as brand new London buses similar to what you have seen running around in the capital. We hope you enjoy this update and we look forward to bringing you further editions in the future.